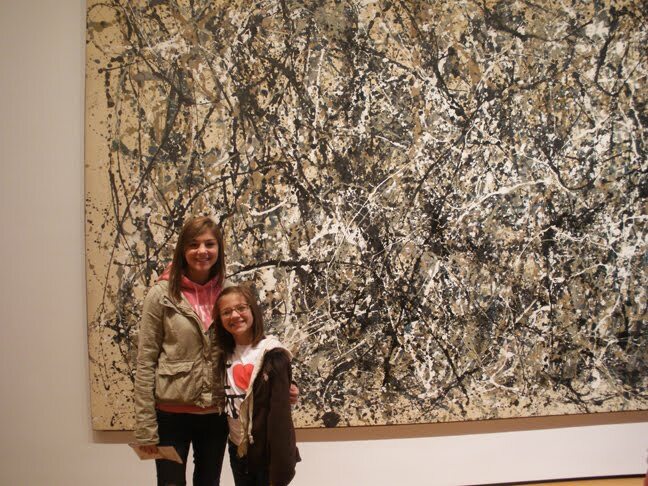 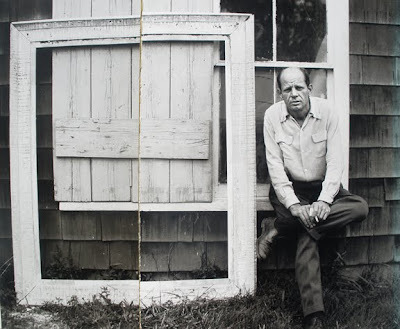 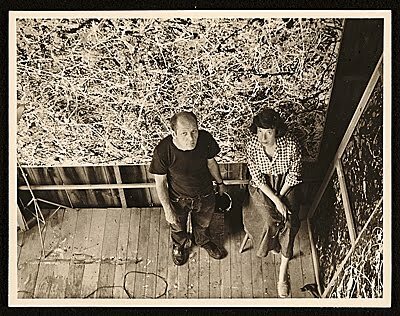 Paul Jackson Pollock was born on January 28, 1912, in Cody, Wyoming. 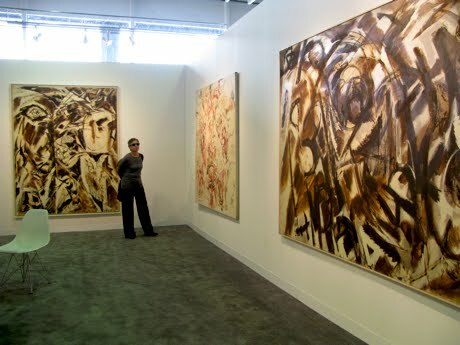 He grew up in Arizona and California and in 1928 began to study painting at the Manual Arts High School, Los Angeles. In the fall of 1930 Pollock moved to New York and studied under Thomas Hart Benton at the Art Students League. 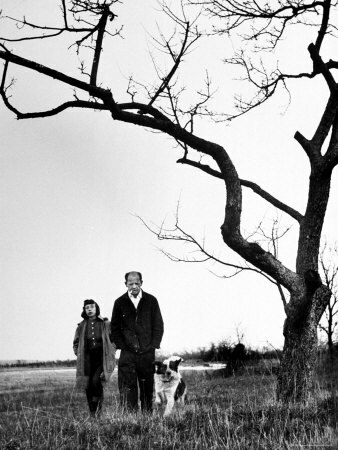 Benton encouraged him throughout the succeeding decade. 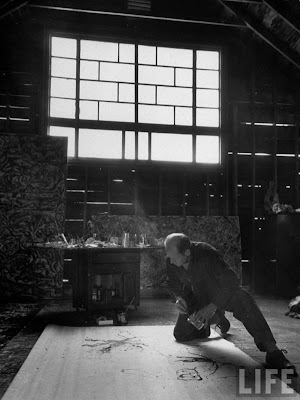 By the early 1930s Pollock knew and admired the murals of José Clemente Orozco and Diego Rivera. 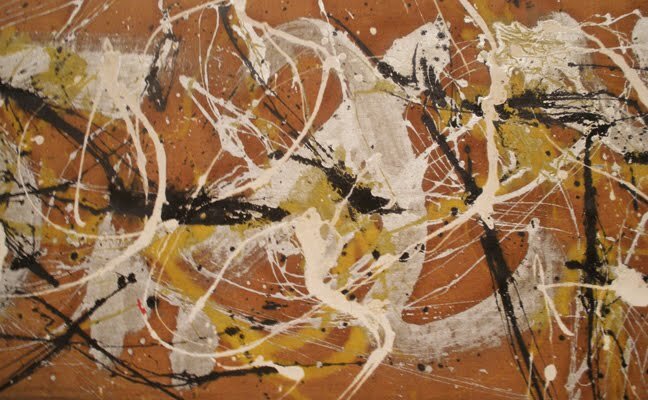 Although he traveled widely throughout the United States during the 1930s, much of Pollock’s time was spent in New York, where he settled permanently in 1934 and worked on the WPA Federal Art Project from 1935 to 1942. 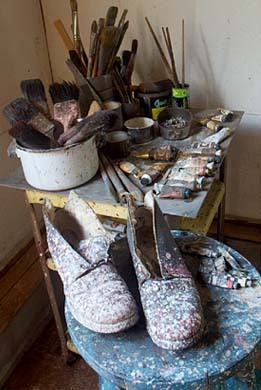 In 1936 he worked in David Alfaro Siqueiros’s experimental workshop in New York. 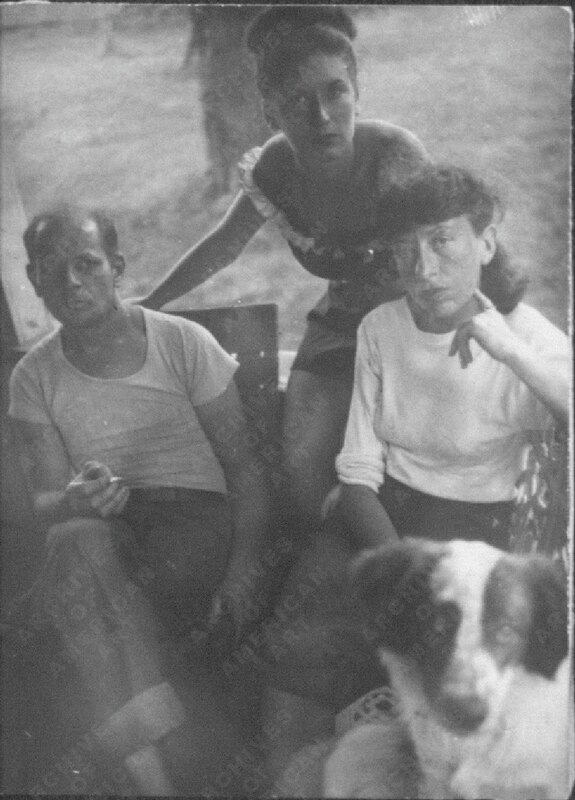 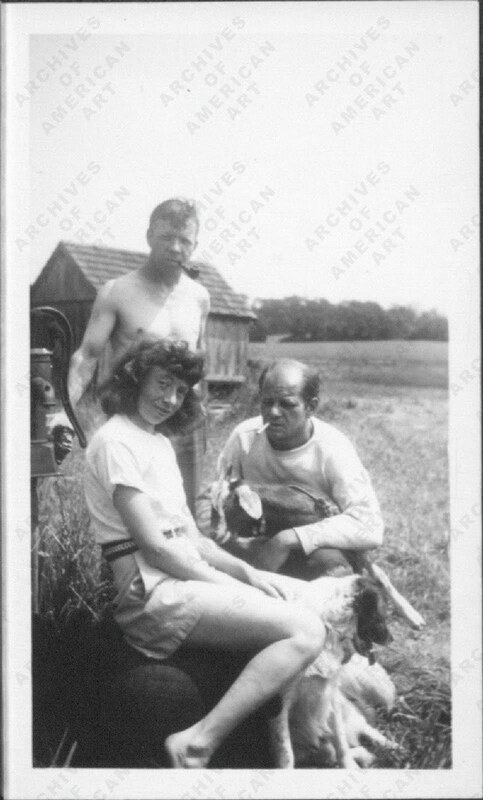 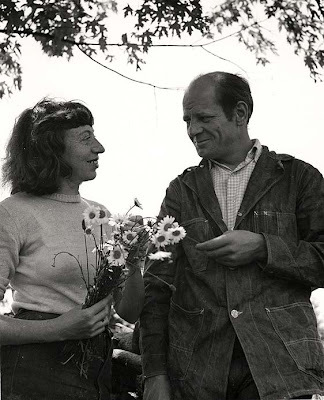 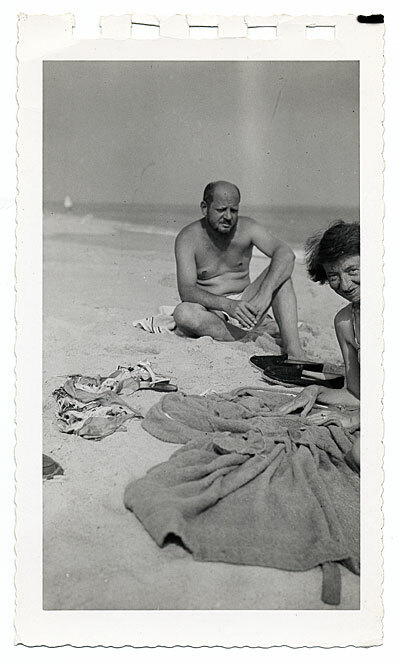 From the fall of 1945, when artist Lee Krasner and Pollock were married, they lived in the Springs, East Hampton, New York. 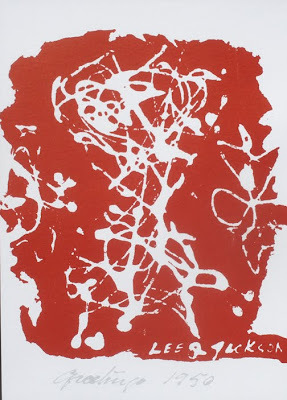 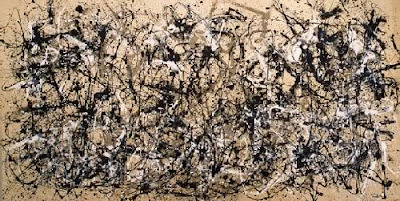 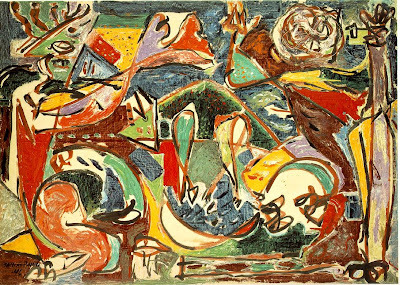 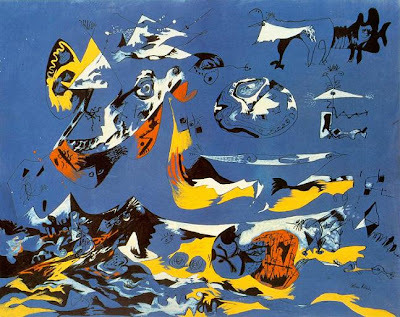 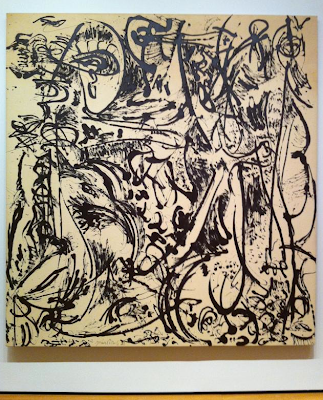 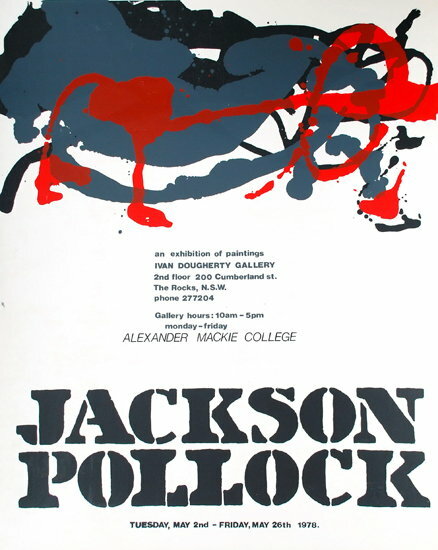 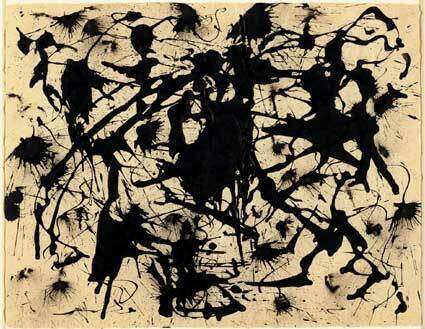 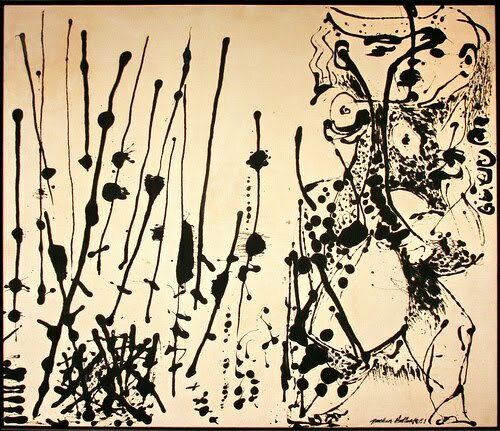 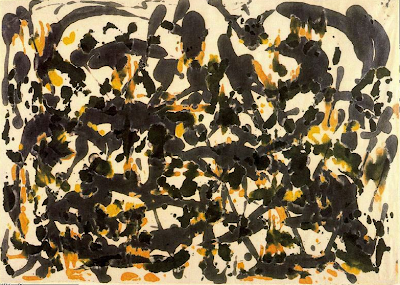 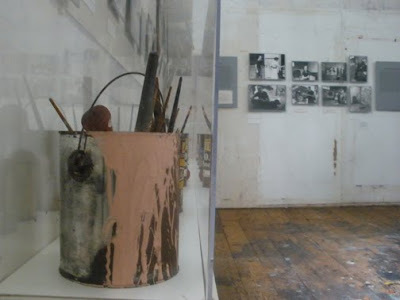 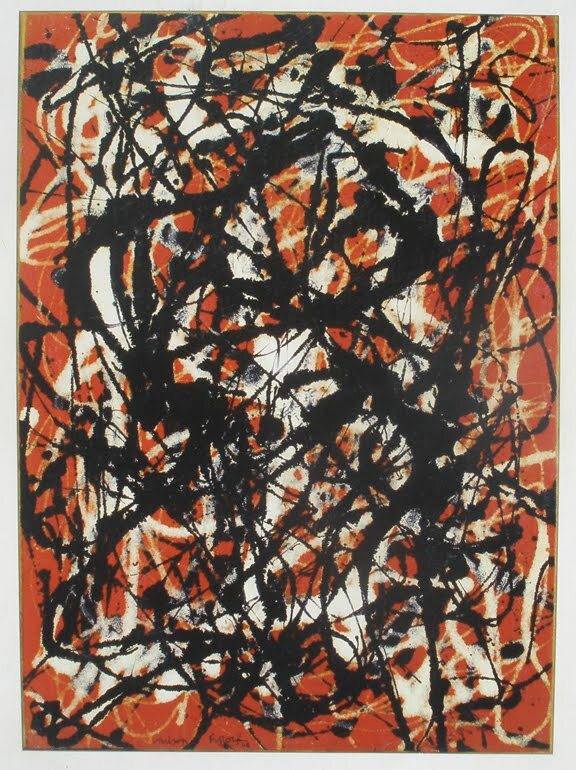 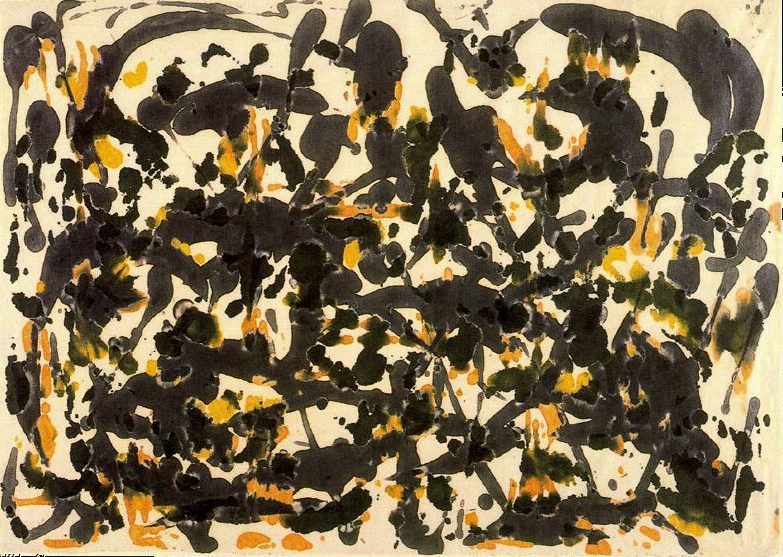 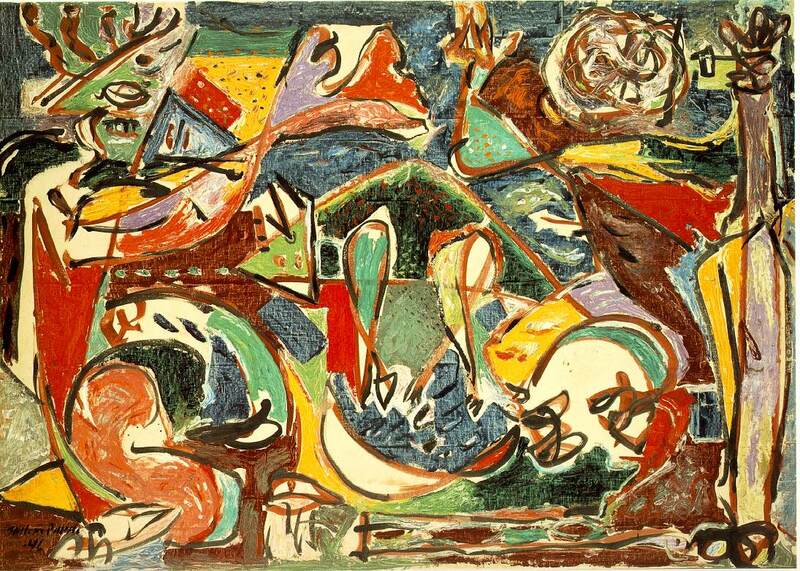 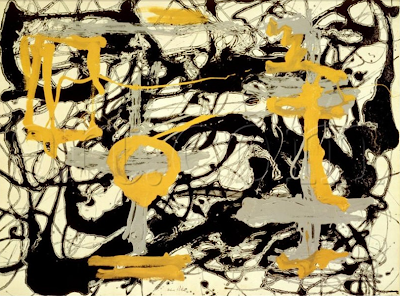 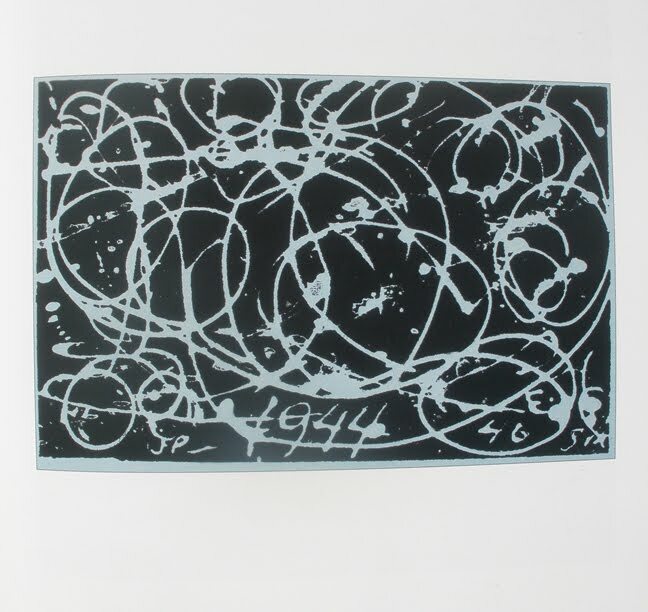 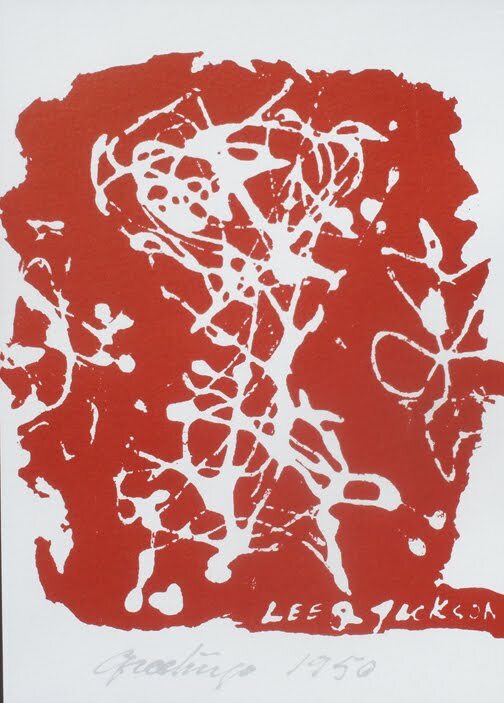 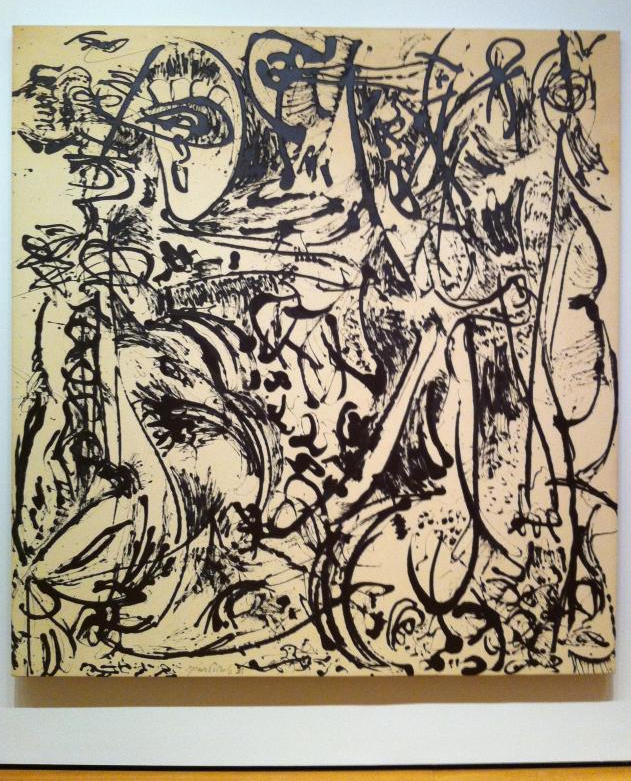 In 1952 Pollock’s first solo show in Paris opened at the Studio Paul Facchetti and his first retrospective was organized by Clement Greenberg at Bennington College, Bennington, Vermont. 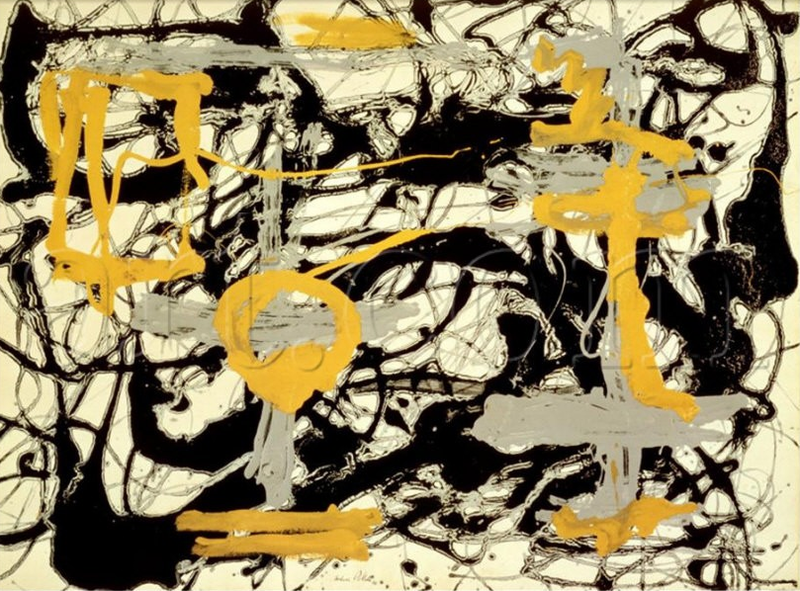 He was included in many group exhibitions, including the Annuals at the Whitney Museum of American Art, New York, from 1946 and the Venice Biennale in 1950. 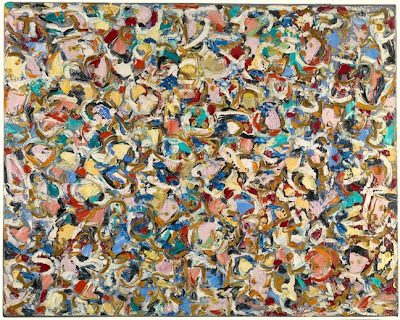 Although his work was widely known and exhibited internationally, the artist never traveled outside the United States. 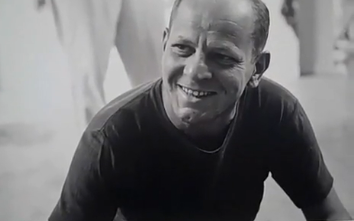 He was killed in an automobile accident on August 11, 1956, in the Springs at the age of 44. 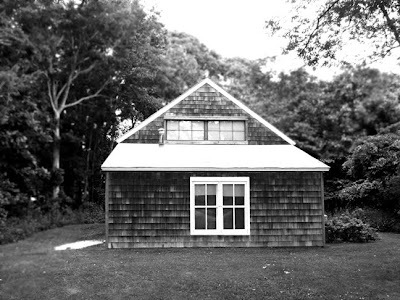 I was screamed at for shooting this pic inside. 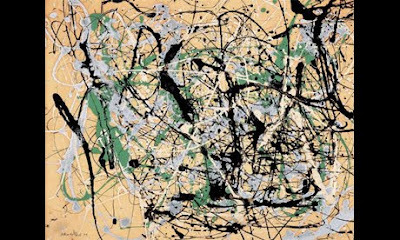 In 1949, when Life magazine asked if Jackson Pollock was "the greatest living painter in the United States," the resulting outcry voiced nearly half a century of popular frustration with abstract art. 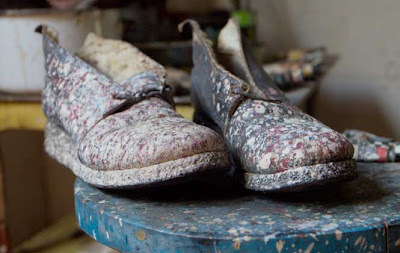 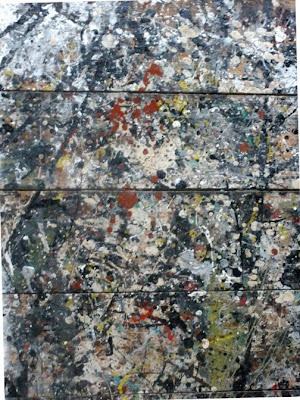 Some said their splatter boards were better than Pollock's work. 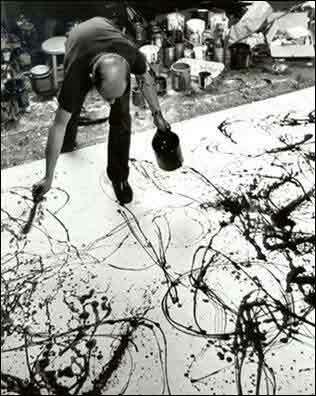 Others said that a trained chimpanzee could do just as well. 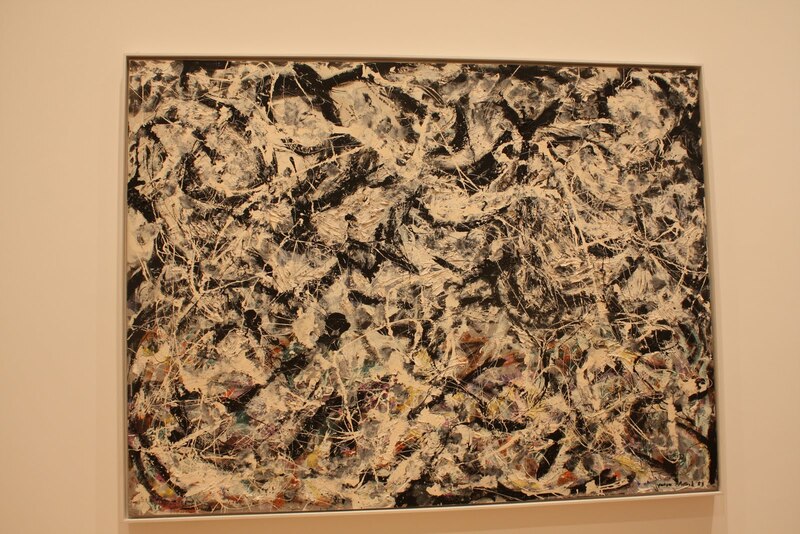 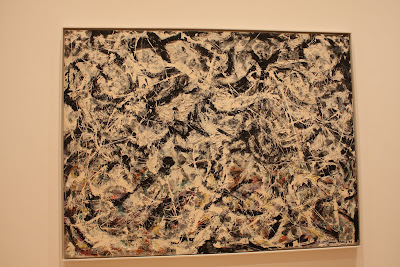 A Pollock painting, one critic complained, is like "a mop of tangled hair I have an irresistible urge to comb out." 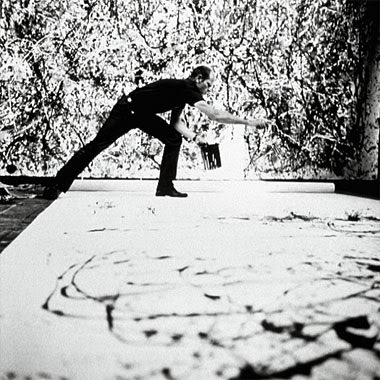 Yet Pollock's reputation has outlived his detractors. 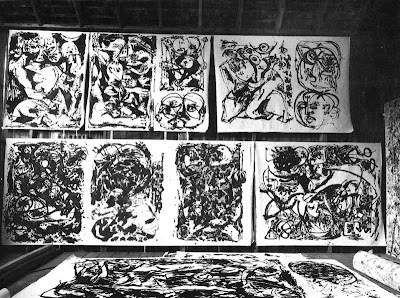 A retrospective of his work several years ago at the Museum of Modern Art in New York City drew lines around the block, and an award-winning film of his life and art was released at the end of 2000. 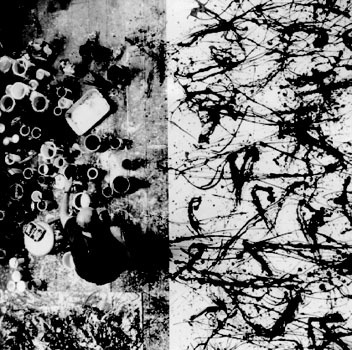 Apparently "Jack the Dripper" captured some aesthetic dimension—some abiding logic in human perception—beyond the scope of his critics. 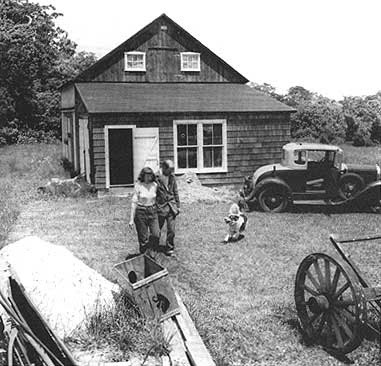 Originally built to store fishing equipment, the small barn once stood directly behind the house, where it blocked the view to Accabonac Creek. 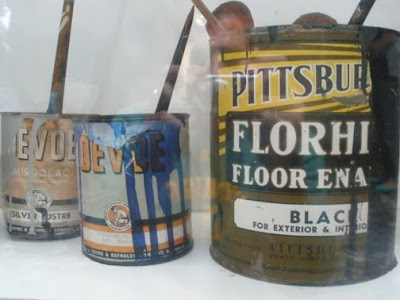 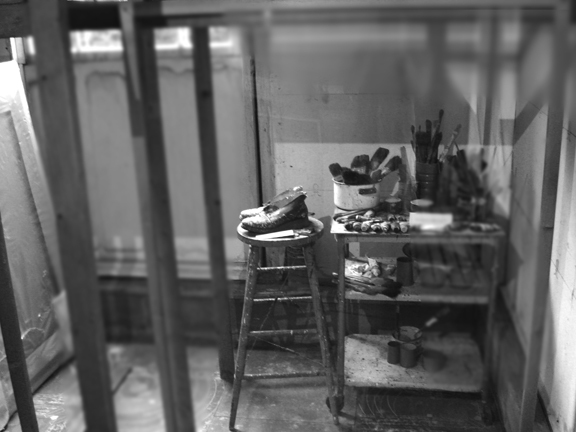 Pollock had it moved before converting it as his studio. In this modest building, without heat or artificial light, he painted his most famous poured paintings. 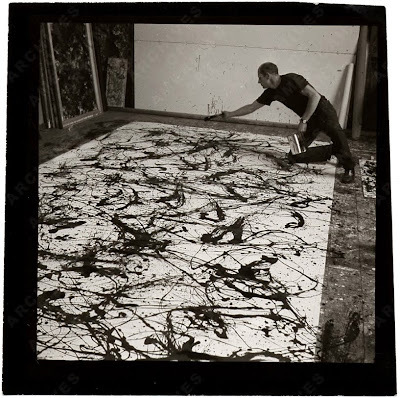 He preferred to lay the canvas on the floor and walk around it, applying liquid paint from all four sides in a process of spontaneous creativity. 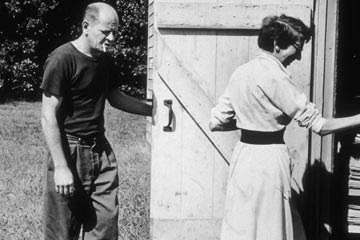 The entrance door was enlarged and moved to the side in the early 50's to accommodate his larger works. 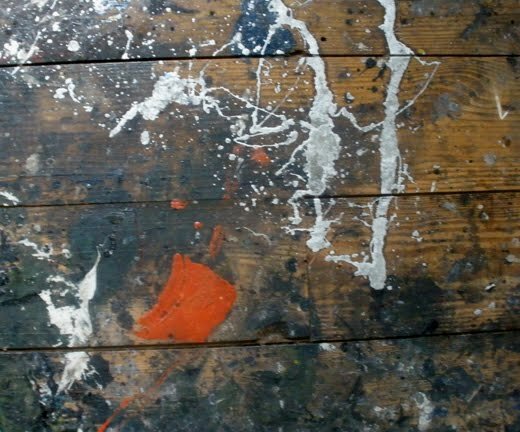 The studio floor is covered with evidence of this singular process. 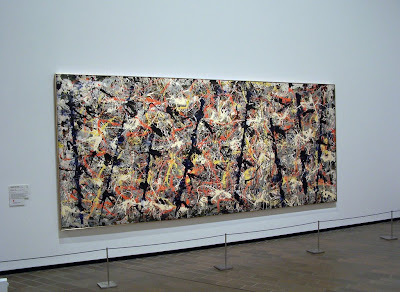 It documents the evolution of Autumn Rhythm, Convergence, Blue Poles and many of his other masterpieces painted between 1946 and 1952, after which the building was winterized. During that renovation, the floor was covered with a new surface, which protected the colors and gestures that had spilled over the edges of his canvases. 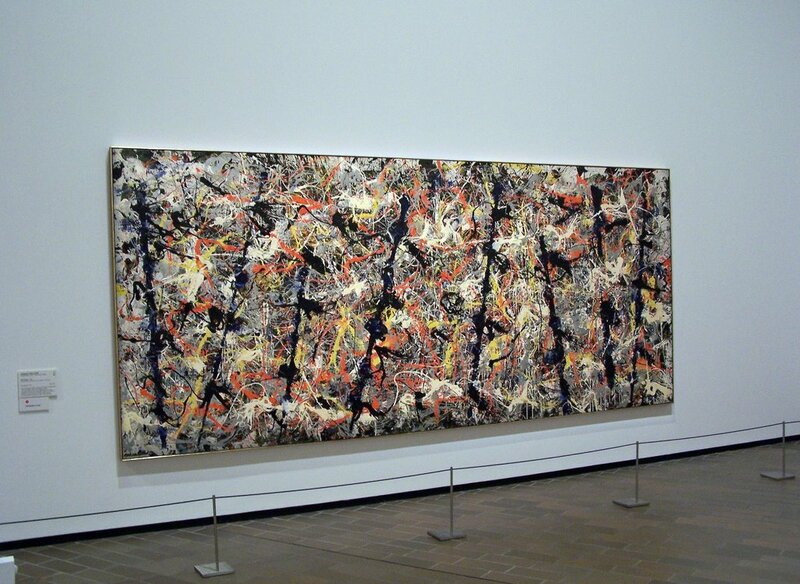 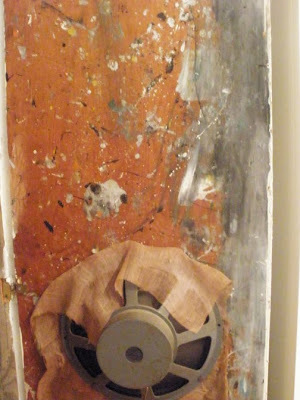 That covering was removed in 1987-88, revealing the evidence of Pollock’s most productive and innovative years. RS behind pollock's house, camera in hand. (detail of Pollock's "music closet" door)- inside his house. 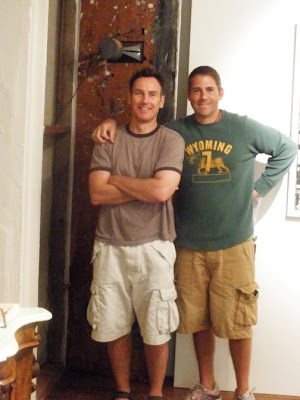 We were playing around with the closet so much- they asked us to please leave the area. 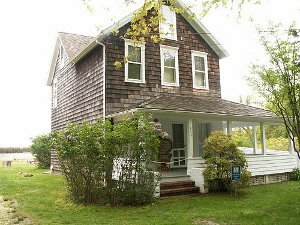 Built in 1879, the house is typical of the 19th century farmers’ and fishermen’s homes in Springs, a hamlet in the Town of East Hampton. 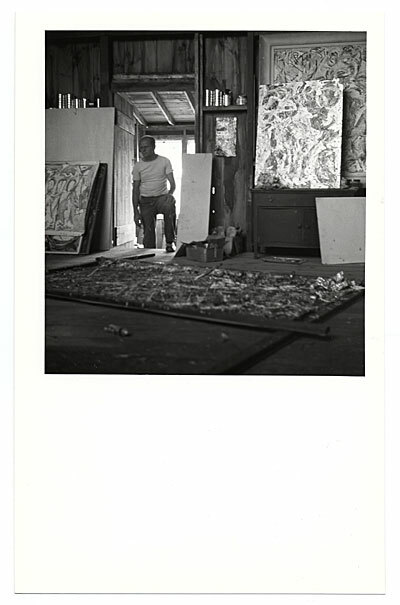 Pollock and Krasner made many changes to the building after moving there. 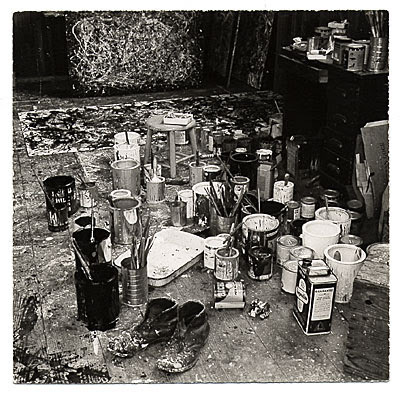 It contains all the furnishings and artifacts that were in the house at the time of Krasner’s death in 1984, some of which were there during Pollock’s lifetime, including his hi-fi phonograph, his jazz record collection, and the artists’ personal library. 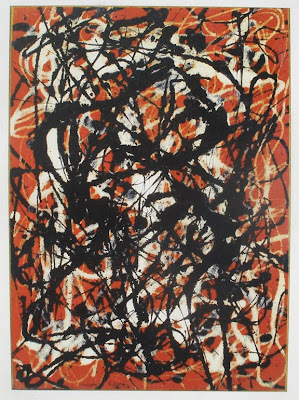 An original late 1930s painting by Pollock, Composition with Red Arc and Horses, and prints by both artists are on display. 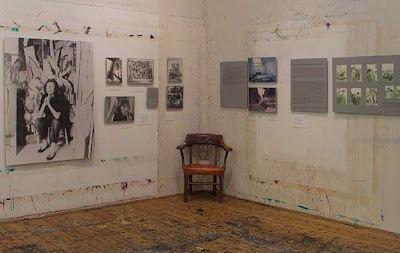 The house also features changing exhibitions of artwork related to the Study Center’s mission. 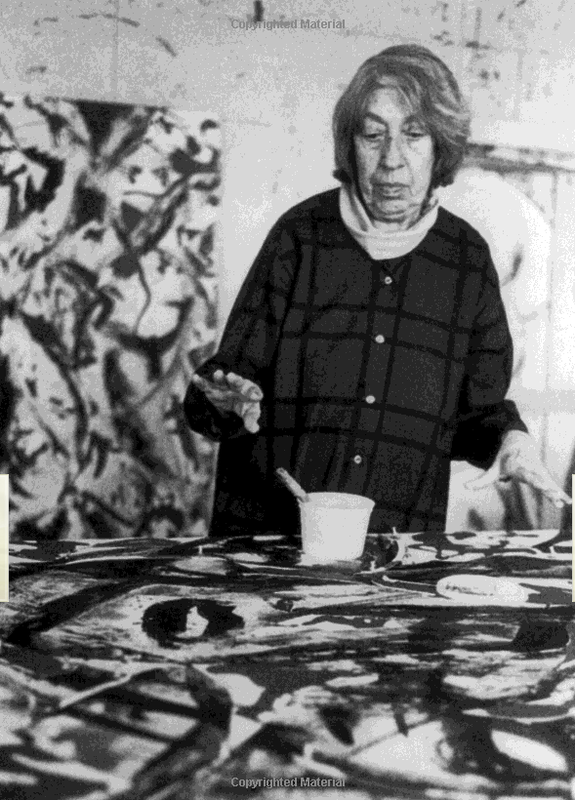 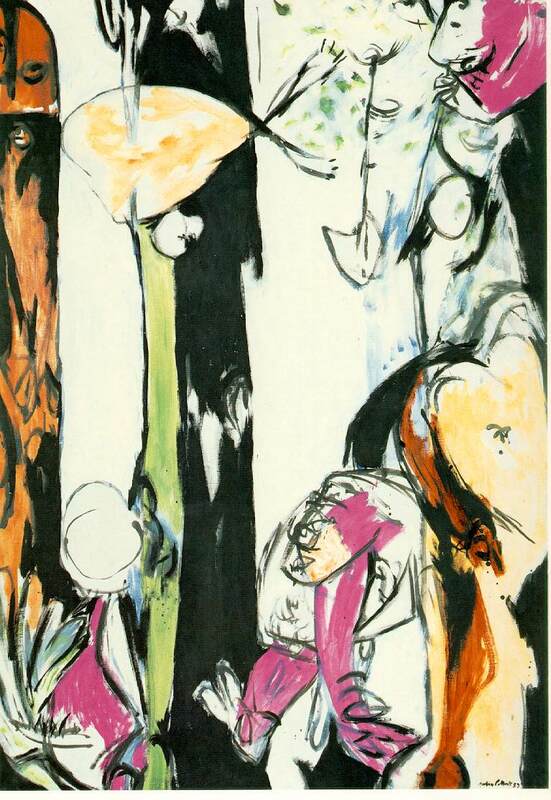 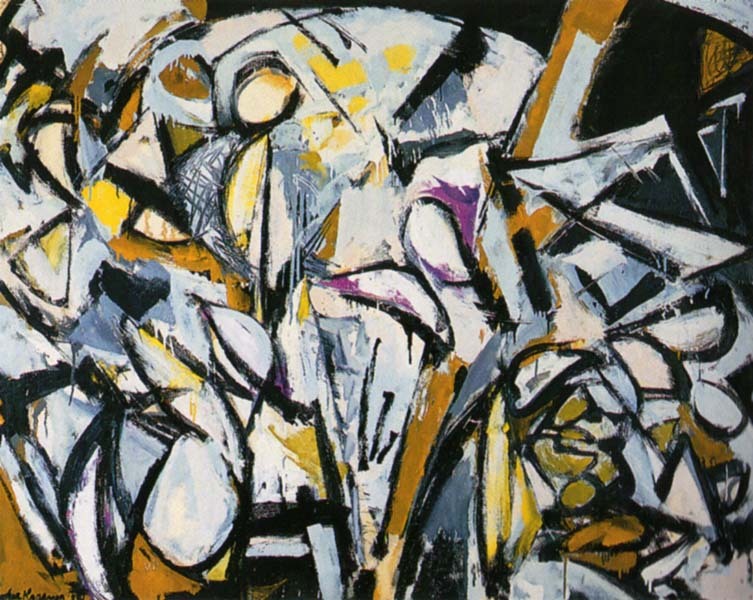 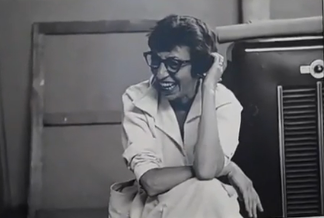 She was an American painter recognized for her unique contribution to Abstract Expressionism. 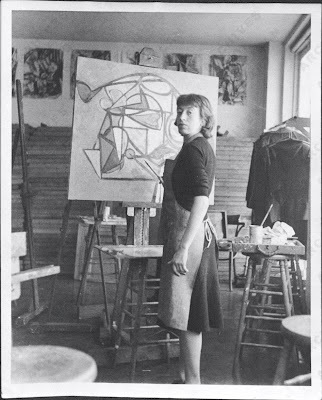 When she was 13 she decided to become an artist and was admitted on her second application to Washington Irving High School, the only public high school in New York City at that time that offered women professional art training. 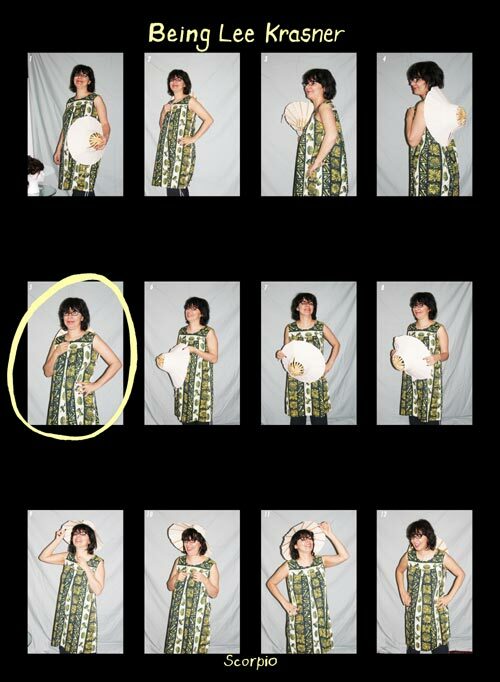 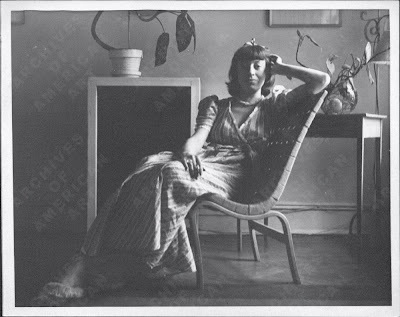 After graduation she studied first at the Women's Art School of Cooper Union and then, in her early 20s, at the National Academy of Design, both in New York. The New Deal's Federal Art Project enabled Krasner to work full-time as an artist from 1934 to 1943. During that time she studied with the hugely influential German painter Hans Hofmann, who exposed her to Pablo Picasso's use of form in Synthetic Cubism as well as Henri Matisse's use of colour and outline. 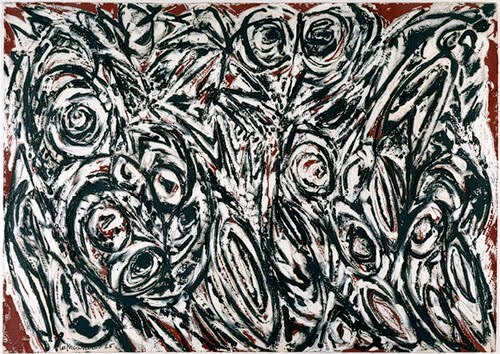 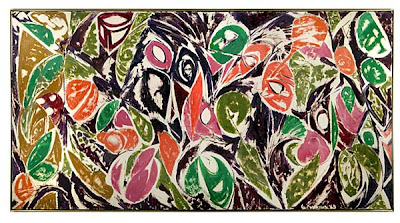 Synthesizing these European influences, Krasner developed her own style of geometric abstraction, which she grounded in floral motifs and rhythmic gesture. 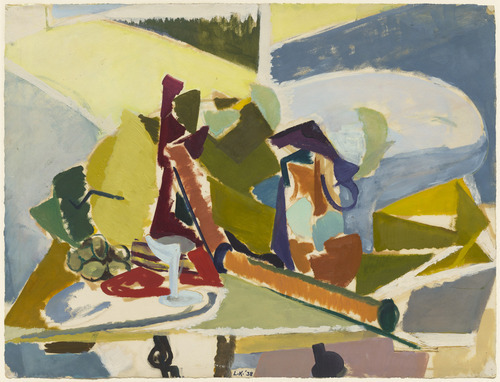 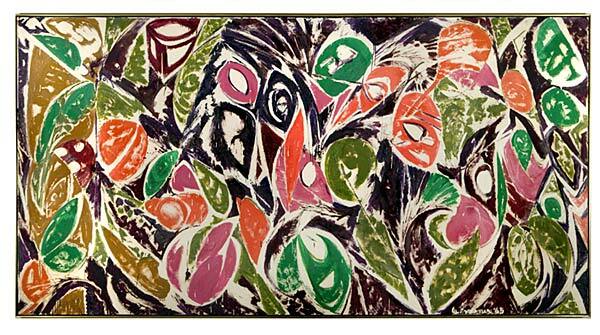 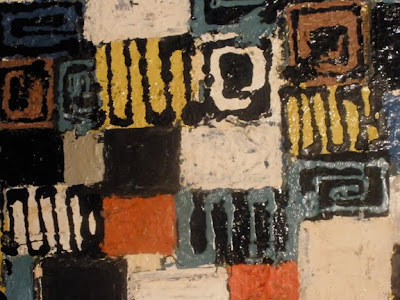 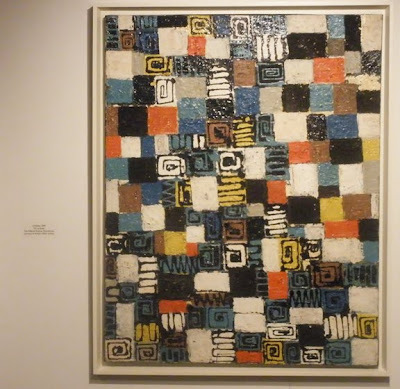 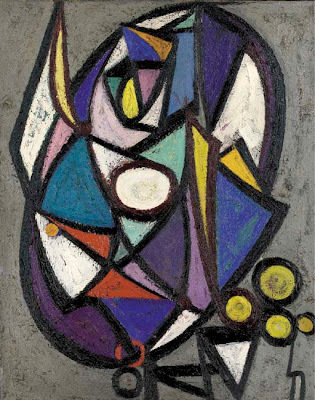 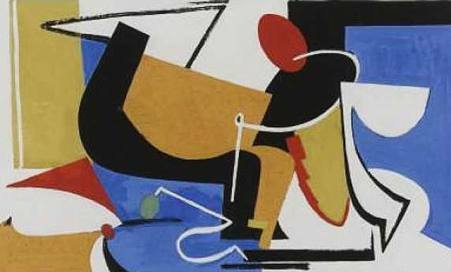 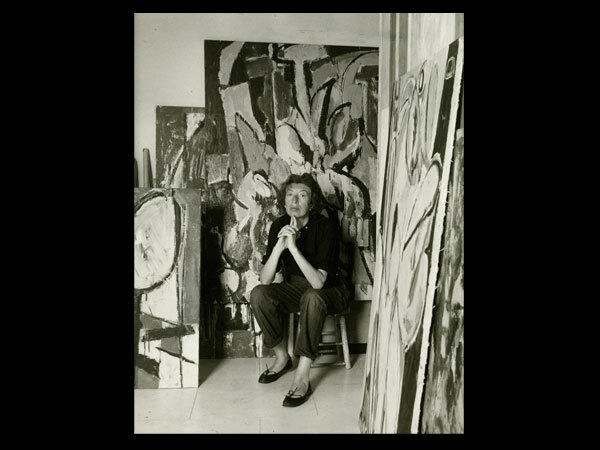 In 1940 she began exhibiting her work with that of other American abstract artists. Her forceful personality and passion for painting soon brought her to the centre of the New York art world, a largely male arena that was in the midst of a period of intense ideological ferment. 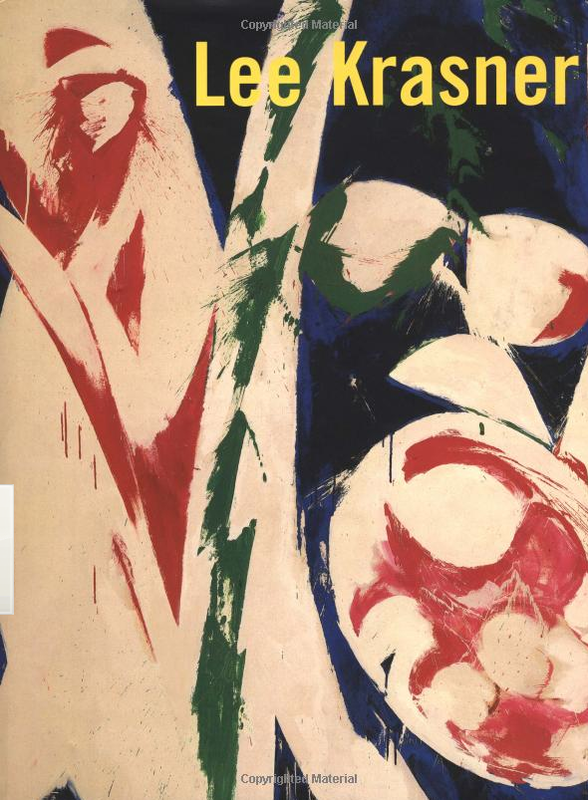 In 1942 Krasner met the painter Jackson Pollock, whose work was being exhibited along with hers at an important show in a New York gallery. 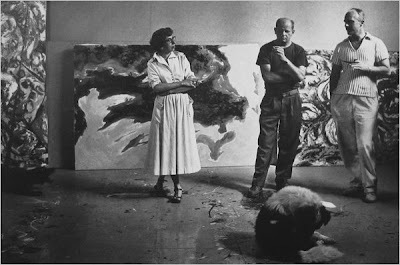 She was struck by the power of his work, and the two artists became friends. After their 1945 marriage the couple moved to East Hampton, New York, where they were to produce a large body of work. 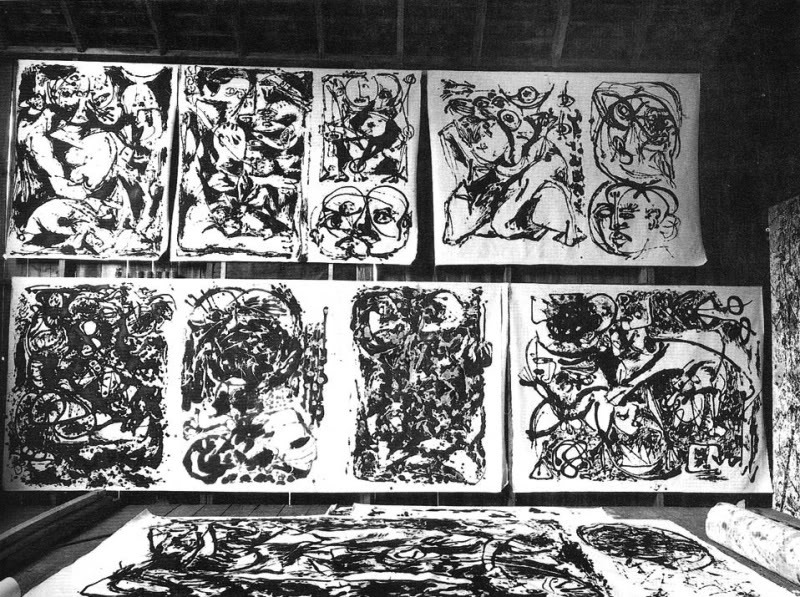 Each artist influenced the other to some extent. In 1946 she began her Little Image paintings, a tightly focused series of works in which her use of dots and drips of paint were inspired by Pollock's “drip paintings” of the period. 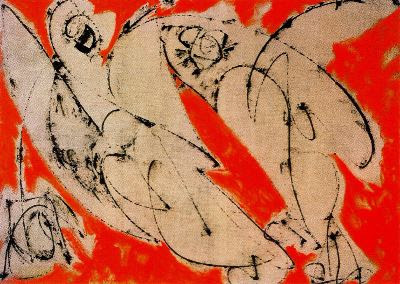 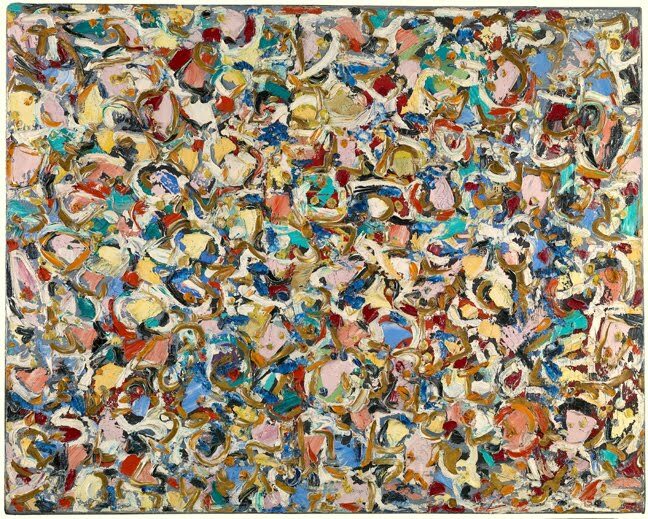 In these and her collages of the early 1950s, Krasner often worked on a small scale, which separated her work from that of the other Abstract Expressionists. 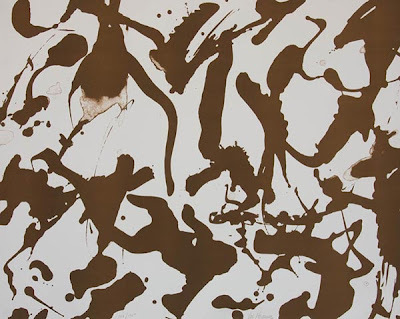 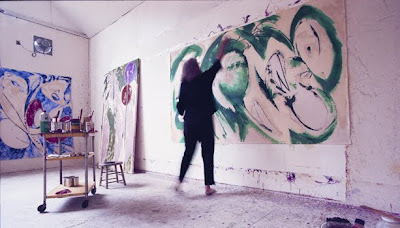 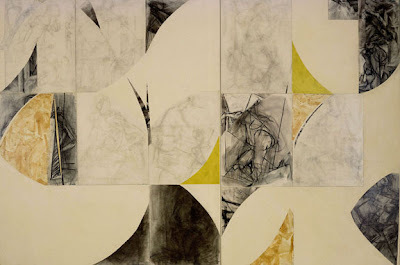 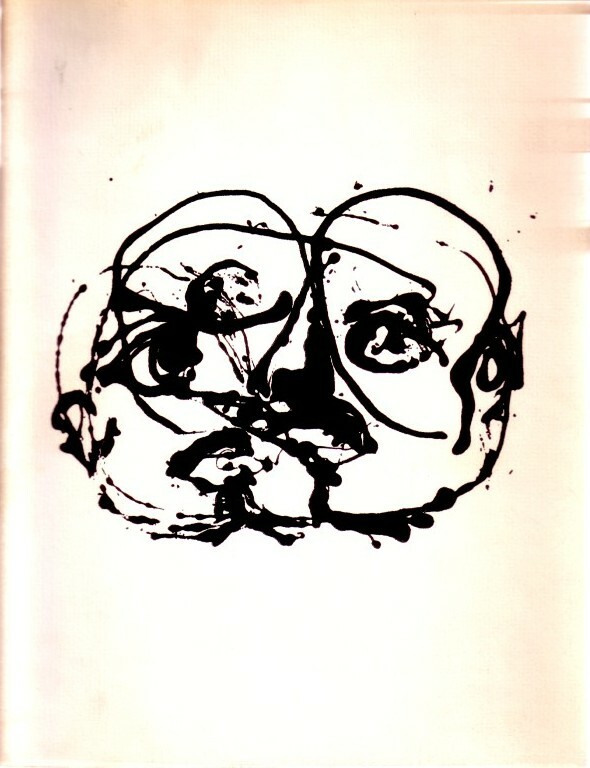 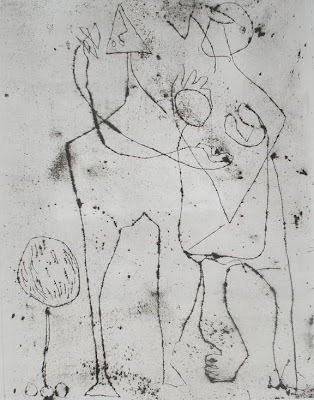 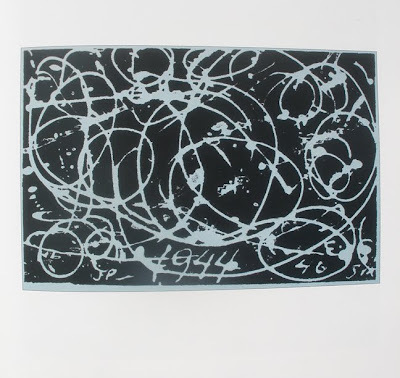 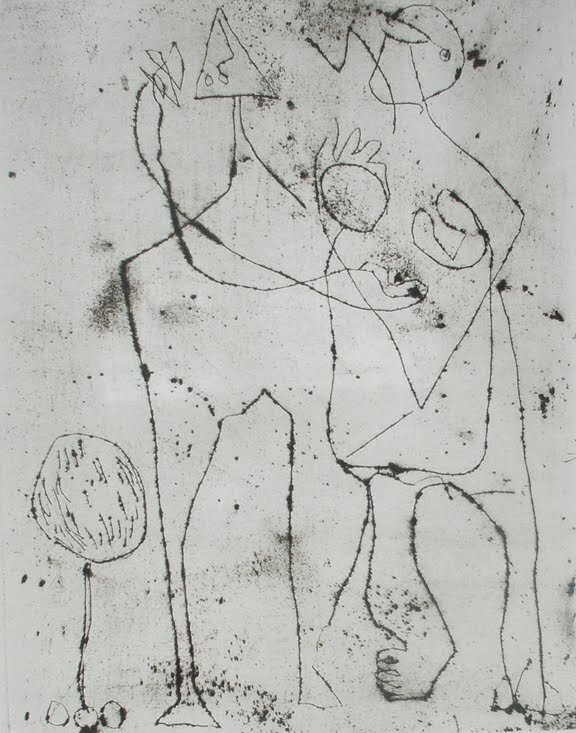 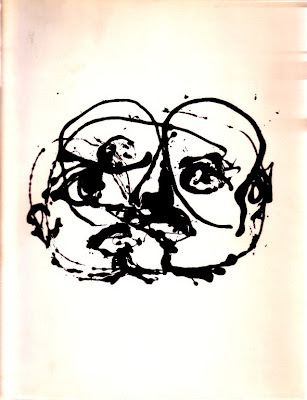 Her work was also unique in terms of her commitment (in varying degrees) to maintaining some figuration—usually patterns from nature and sometimes calligraphic elements such as Hebrew letters—and a cerebral sense of control, in contrast to the less-controlled automatism being practiced by her contemporaries. 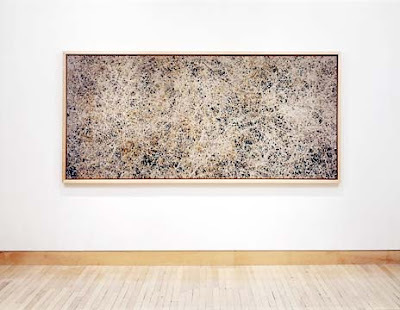 In the years after Pollock's death in an automobile accident in 1956, however, she created a series of enormous paintings filled with thick, expressive strokes of umbre paint that abandoned figuration and instead presented raw energy, perhaps in an attempt to express her overwhelming sense of grief. 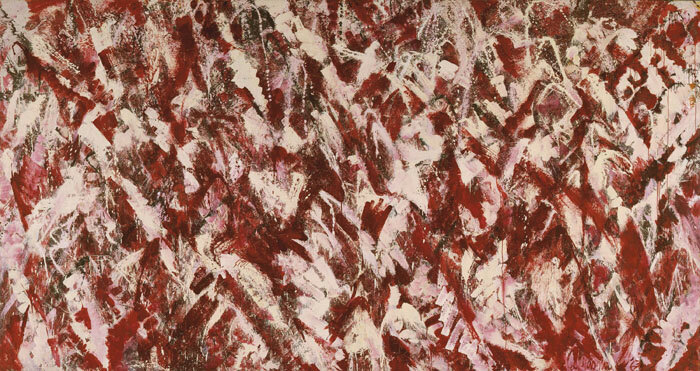 In the 1960s and '70s, Krasner continued her trademark explorations of colour and graceful, rhythmic form in paintings and collages, building upon the passion of her large-scale abstraction but also returning to her love of hard-edged figurative elements. 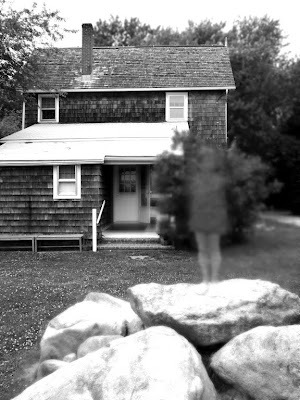 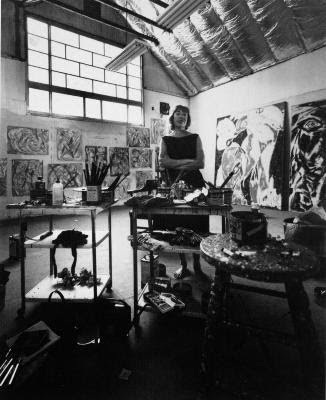 The Pollock-Krasner House was created under the terms of Lee Krasner Pollock’s will. 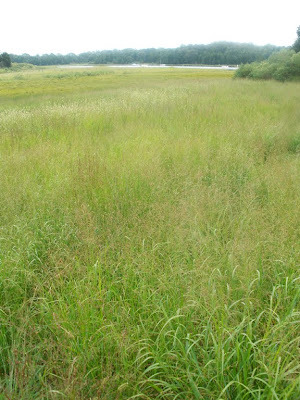 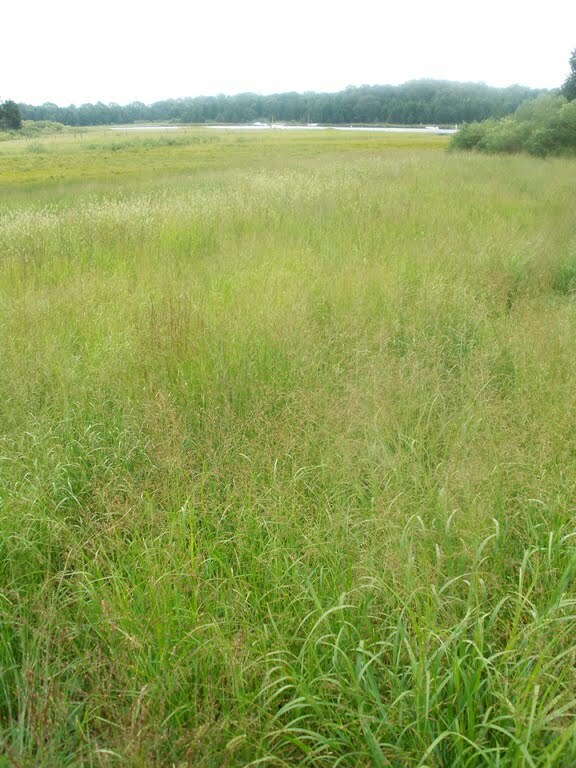 She instructed her executors to deed the property to a charitable institution. 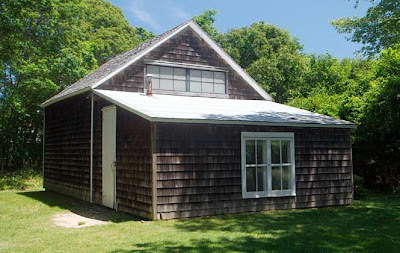 She envisioned it as “a public museum and library,” to show the setting in which she and Jackson created many of their works, and as a place for the study of modern American art, especially the eastern Long Island art community. 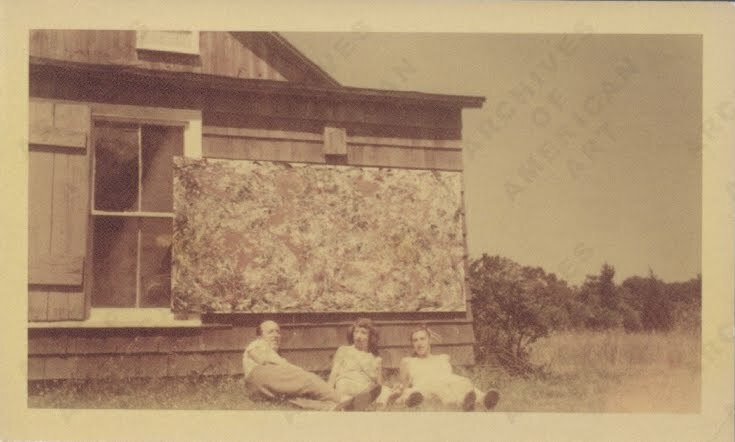 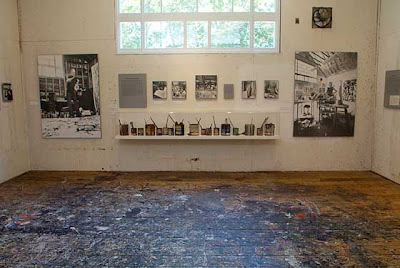 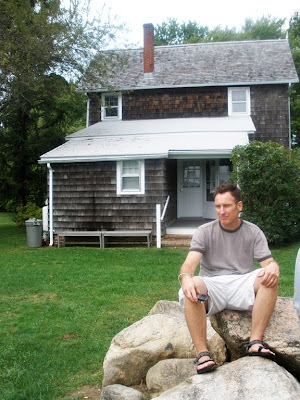 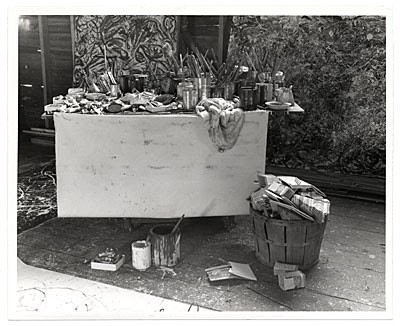 You can visit tour the Pollock + Krasner home and studio in East Hampton, NY may thur Oct.. I have been there twice and it's quite awesome.